Many thefts occur by people who you openly allow in your home. These can include a housekeeper, cleaning service workers, contractors, cable workers, babysitters, caregivers, acquaintances, and even guests from a party. There have been many recent examples of theft committed by in-home workers across the country just in the past couple of weeks. In Kansas, a former housekeeper stole more than $500,000 in jewelry while working for her employer. A construction worker in Florida, who was completing repairs on a home damaged by Hurricane Irma, stole two jewelry pieces valued at $6,200. Another unsuspecting homeowner realized that 15-20 pieces of jewelry had been stolen after holding an open house with a realtor. Her story shows the importance of locking up valuables or hiding them away as strangers wander your home. It’s not always someone you let in; thieves may case your home to determine if you are a good target. In one case, a brazen burglar used a doggie door to enter a home and steal valuable jewelry, and elsewhere a serial jewel thief broke into 30 homes to steal jewelry totaling half a million dollars. It’s important to be cautious before letting any workers in your home. This includes those who will be there for a single visit and those who will be repeating their service such as a caregiver or cleaning person. 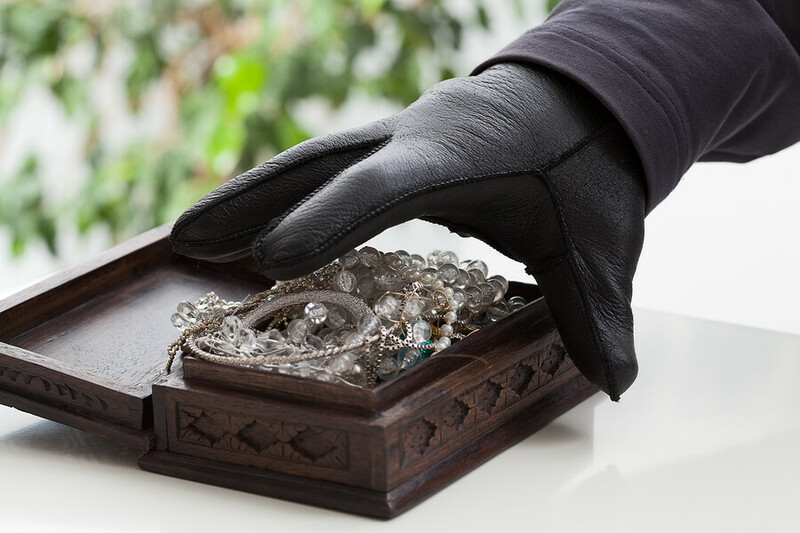 Think of jewelry as cash – that’s how thieves think about it. Would you keep your cash where you keep your jewelry? Ask to see their ID when they arrive. Ask for multiple references and follow up on them (this is useful when hiring long-term staff). Use someone who is licensed and bonded in your state. Ask if the company uses subcontractors. Lock up valuables when anyone is in the house. If they have a key (such as a babysitter or nanny), changes all locks and codes once they no longer work for you. When possible, be at home when workers are at your home. Pay attention to where workers are and what they are doing. Remember the first place a thief looks for valuables is the master bedroom. Install a security camera (inside or outside). Make your home a difficult target with a security system. Keep all entrances secure and well-lit. Be cautious and hide valuables well over the holidays when burglars believe you might be traveling. Do not post online when you are traveling or while you are there. Post photos and stories when you return home. Keep fine jewelry in a safe. Don’t keep expensive jewels in a regular jewelry box (only costume jewelry). If you do not have a safe, hide it in creative places until you can get your valuables stored away securely. In addition to these security tips, jewelry insurance should also be at the top of your do-to list. It should cover damage, loss and theft. Don’t just try your luck and hope for the best. If you understand the risks of theft, you will find insurance with Lavalier is well-worth keeping your peace of mind. Smart ways to secure cash, jewelry and other valuables from home theft. www.reolink.com. (accessed Nov 13 2018).